Please refer to our stock # T 1740 when inquiring. Flower power for the ear lobes. Vintage earrings by this maker are always collectable. 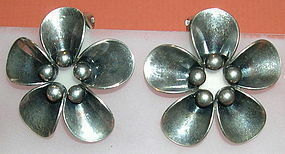 Clip these circa 1970 Danish clean classic floral earrings signed: Sterling Denmark N. E. From for Neils Erik From of Denmark, on your ears and step out in vintage Danish style! 1 1/4" across as a five petal flower with 5 ball motif. Classic! Large comfortable clips. 13 grams on postal scale, super condition and needing a good polishing. Decades of rich darkening!